Hey there! 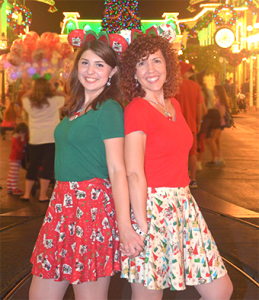 We’re Shawnee and Susan, a daughter and mom duo who love to document our quirky adventures around this crazy and beautiful world. This is a lifestyle, Disney, DIY blog where we endeavor to create fun and engaging content revolving around our lives here in Orlando, Florida. What are we into? Sewing, cosplay, Marvel, crafting, sweets, Disney, art, photography, theme park couture, food, music, family, and a healthy dose of 80’s pop culture. Does that cover it? No, not really, but the surface layer is a pretty good place to start. Next layer is sarcasm, coffee and Gilmore Girls. If you’re into that then we could be friends! We’re also very much into spending time together with our family of 4. Our crew means the world to us so we value our time with one another deeply. And finally, we love people. Pure and simple. If we can do something to bring a smile to your face, then it’s all good.